The Scottish Aviation Pioneer was a STOL aircraft manufactured by Scottish Aviation in Scotland. It was used for casualty evacuation and communications and could accommodate a pilot and up to five passengers. The Pioneer was planned to meet the requirements of Air Ministry Specification A.4/45 for a light communication aircraft. The three-seat prototype A4/45, powered by a 240 hp de Havilland Gipsy Queen was a three-seat high-winged cabin monoplane. Four prototypes were ordered, under the name "Scottish Aviation Prestwick Pioneer" (Serials VL515, VL516, VL517, and VL518). In the event, only the first two were completed. The prototype aircraft (VL515) first flew in 1947. The use of the Gipsy Queen engine resulted in disappointing performance, and so the A.4/45 was not ordered by the RAF. Scottish Aviation decided instead to produce a civil version. This was achieved by fitting the two prototypes (VL515 and VL516) with new, more powerful engines as the "Pioneer II"
The prototype Pioneer II was the former prototype Pioneer I, (VL515) which was civil registered as G-AKBF. Powered by a 520 hp Alvis Leonides engine, and first flew on 5 May 1950. The second prototype Pioneer I (VL516) was similarly converted, and civil registered as G-ANAZ. . 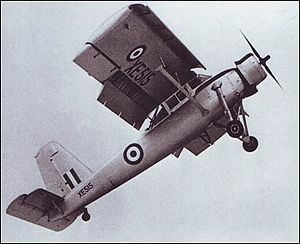 The Pioneer II demonstrated excellent STOL performance, and was ordered by the RAF as the Pioneer CC.1. The first Pioneer CC.1 to be delivered to the RAF was serialled XE512, which was delivered on 11 August 1953. Ironically, XE512 was essentially the prototype Prestwick Pioneer I from 1947, re-engined with the Alvis Leonides engine, and refurbished for RAF use. (Thus, VL515 became G-AKBZ, and then returned to a military serial as XE512). The next three aircraft delivered (constructors numbers 102, 103 and 104) were likewise the second prototype VL516/G-ANAZ plus the partly completed third and fourth prototypes VL517 and VL518). As XE513, XE514 and XE515 they were delivered on 15 August 1953, 3 September 1953 and 10 February 1954 respectively. Two of these first batch of four are illustrated on this page. The RAF used the Pioneer extensively for tasks such as casualty evacuation in the Malayan Emergency, Aden and Cyprus. With its unusually large slats and flaps, it was able to operate out of very short, unprepared strips and could take off in as little as 225 ft. The Pioneer remained operational in small numbers until 1969 . 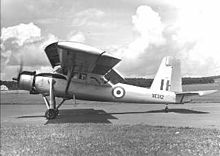 Pioneers were also used by the Royal Ceylon Air Force and the Royal Malayan Air Force. Pioneer : Four-seat STOL transport aircraft, powered by a 240-hp (179-kW) de Havilland Gipsy Queen 32 piston engine. Pioneer 2 : Five-seat STOL transport aircraft, powered by a 520-hp (388-kW) Alvis Leonides radial piston engine. Pioneer CC Mk 1 : Five-seat STOL casualty evacuation, communications aircraft for the RAF.